Some people have a Cricut. I have my very own personal vinyl cutter. Her name is Greta and she is one fine vinyl cutter, but she is tough. You see, when I talk there is a lot of hand waving and excited gesturing. As a matter of fact, truth be told, I am heavy on the exuberance and excitement and light on the follow-through. For example, I say, “Greta. 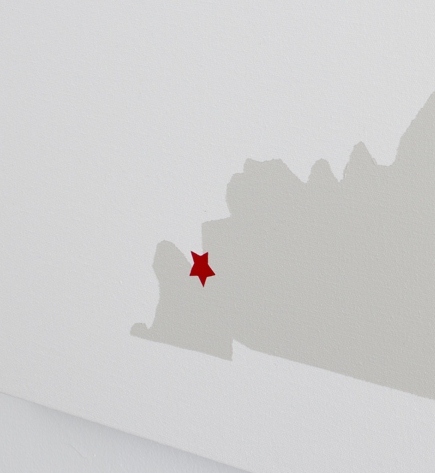 I need the largest state of Kentucky possible you can create in vinyl. So I can create…..
Greta is not a hand-waver. Greta is not overly, unnecessarily exuberant. Greta is efficient and task-oriented and always follows through. And, of course, the next day a 12″ x 8″ vinyl Kentucky shows up at my house. “I want to see it when you are through,” says my vinyl cutting task-master. So I stop my hand-waving, curb my enthusiasm and get to work. (1) Bought two canvases from Hobby Lobby. They came two to a package. 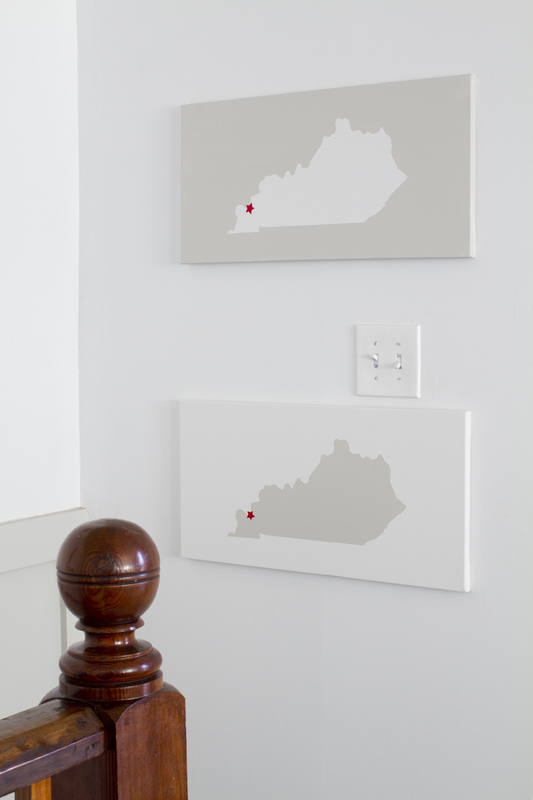 I bought long canvases because Kentucky is a long state. People who live in long states or square states might want to take this into account when purchasing canvases from Hobby Lobby. 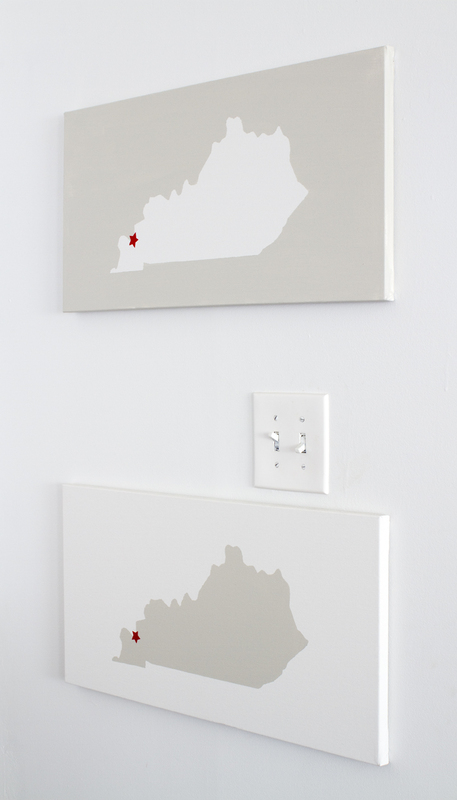 (2) I applied the vinyl of Kentucky to one canvas. (3) I applied the outline of the vinyl to another canvas. (4) I painted the two canvases with leftover paint samples from these projects. (5) I waited one hour while I watched Project Runway All Stars and bemoaned the fact that Heidi Klum and Tim Gunn are not on the show. (6) I peeled off the vinyl and debated if I should use them again, realized that Greta might frown on this, and threw the vinyl away except for one corner I saved. (7) I cut out a star from that little piece of vinyl and added it to the canvas. (8) Then I hung the canvases on the wall of the playroom at the top of the stairs with thumbtacks. (9) I called Greta and tell her how wonderful she is and start hand-waving about my next project. Don’t even think about asking for Greta’s number though…. What a great resource you have in Greta! That’s one cool project. Greta is great! Love that you used the positive and negative pieces of vinyl! Greta rocks! And this project is delightful… thinking of advertising for a “Greta” so I can whip out a couple of Texas projects like these. 🙂 Love ’em! Love, love, love this idea, KariAnn. 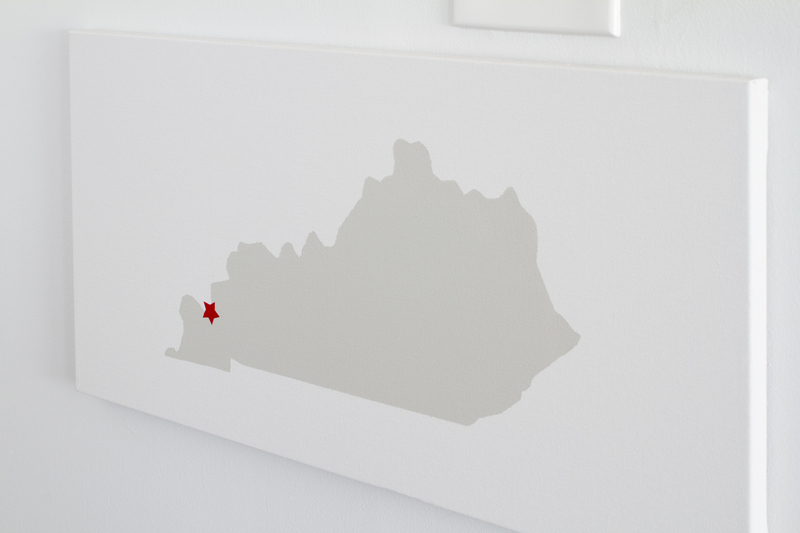 Would make a great housewarming gift for someone moving to the state. most likely not be able to speak..and you know, he’s right..I would be mute!.. Have a wonderful day…You have the most wonderful ideas (saying with both hands waving)! Great project! I still have another similar idea in my head from your other blog…the one with the keys and addresses of previous homes underneath. Love this! Greta is one cool cucumber! I love this idea!! I need a Greta! tell greta i live in WISCONSIN. and my email addy is on my blog. That is such a cute idea! I really like that. You made it sound so simple too. I think that adds a wonderful personal stamp to your home. Those are great. I need a Greta! So jealous of your Greta! I really want to do some state art for Jesse and I’s new bedroom, but I can’t decide what to do. Awesome! They turned out great. That Greta is a keeper! Ahh this is so simple and fabulous! love it! Ooooooooh. I love that! Will have to remember this project for sure. -ps Any chance of getting your photo up in the side bar? Love to see who I’m talking to! Are you in Kentucky? How many Greta’s can there be in Kentucky? Bloggers, let’s hunt her down! What a great project -love it!! Very cool idea. I love it. Would a batch of fesh, warm chocolate chip cookies make you think twice about giving Greta’s number away? You do beat all! That’s the way we talk in this part of ‘ol Kentucky 🙂 That is the cutest, ever. To quote the kids at school—I’m going to copycat that. What a fun and cool project! Love the red star. What a nice housewarming gift, especially if someone has move out of state! I won’t ask for her number, but I seriously need my own personal Gretta. I have a guest room where she can live and make fun projects for me. Love the canvasses! I love this! Greta is awesome! Your artwork is perfect! I need Greta too! I’ll bake your bread for Greta’s phone number! Thanks KariAnne….You flatter me so! I’m linking this blog entry to my blog! What an absolutely fabulous idea! I love it, I wonder how hard it would be to make one of Manitoba, hmmm…I will think on that. Thank you for the “how-to”. *hands waving* great job ladies! can’t wait to see your next Greta project. Have a great weekend! These look fabulous! My daughter moved from Michigan to teach 3rd grade in Kentucky, not sure how close she is to that star on your lovely project. I love that. I’m going to see if my wife can do this with a map of New Jersey! Preferably, with the Italian flag integrated somehow for her sake. What a nice friend you have. That is a most clever idea and a wonderful piece of art. And what a wonderful friend you have, too! But no matter if it is easy, as you say…. You still had to think-it-up. So you are very cool too, my Dear. “Auntie” sezzzzzzzzzzzz. Where can I find a Greta? Karianne, you are such a tease – but only in a very good way. This looks beyond awesome. Kudos to you and your Greta. I wish I had a Greta, but I just have me! I will have to try this…I like the simplicity of it! I am so calling you out on that “easy peasy” remark. i need a greta too. love your kentuckys (or kentuckies?). and amen to #5. no one can replace tim gunn. What simple elegance! I’m so glad I found your lovely blog! Might be easy peasy to you…but it looks like a million bucks to me! BTW – people like me are always looking at thrift stores for scraps from other projects…so pretty please…pretty in pink please…don’t throw scraps away!! !